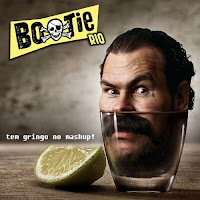 The title translates to "Foreigners in the Mashup," and it features two RIAA tracks, both featuring '60s lounge organ master Walter Wanderley: "It’s Like That Summer Samba" (w/Run DMC), and Poker Samba (w/Lady Gaga). And the mix is dedicated to me! (takes a bow) and Boston's dj BC.